A very hastily planned trip due to having a few days off work and not having escaped from the country since February. More to the point I had not set foot in Europe during 2017 and things were getting desperate. Planning for the trip was, at best poor and escaping the UK was going to be difficult without major expenditure given the start of the school holidays. While out with friends on the Friday night I found myself calling P&O to discover that their Dover-Calais route was fully booked until early evening (even for foot passengers)- not good for getting to Paris, therefore early Saturday morning I found myself booking onto the 15:15 Portsmouth-Cherbourg ferry. That left me a few hours to pack, and get the train down to Portsmouth. I had checked the weather for the weekend and helpfully that symbol of a cloud with the sun sticking out of the top and a lightening bolt from the bottom prevailed. By Portsmouth the heavy rain had arrived. The walk from Portsmouth & Southsea station is slightly quicker and a *little* more pleasant than that from Dover Priory to the ferry terminal. The terminal for the cross channel ferries is certainly a lot nicer than Dover. After the worlds shortest bus ride (about 200m) from the terminal to the boat I was soon setting sail, slightly late, on board the 'Normandie Express' fast ferry to Cherbourg. Weather was changeable with some great views of the Isle of Wight and also some heavy downpours. One child on board spent a good half an hour screaming it's head off but aside from this the sailing was uneventful if a bit choppy at times. Due to poor weather we were late into Cherbourg but it didn't really matter. There is no train to meet the ferry. The ferry docks quite close to the old town but one is then bussed to the terminal building which is about as far as the town in the opposite direction. Once there there is a free shuttle bus to the 'town centre' which meets the boat. I took this as it was raining- the description of 'town centre' is perhaps a little unfair as the bus drops you on a road junction on the other side of the ferry port, a stones throw from where the boat docks in the first place. It was raining again as I arrived at the Hotel Ambassadeur with a room overlooking the old harbour. Cherbourg was surprisingly pleasant and I enjoyed a good meal before bed. Paris St Lazare. I would take this train on the 16:57 towards Pontoise. Woke up to find that it wasn't raining which is always a positive. There was no rush to get out today as my train wasn't until 12:53. Explored Cherbourg a little more including climbing up to the Musee de la Liberation which is quite a climb with luggage! The view however is worthwhile. I also had a wander around the former Gare Maritime building (now a museum - Cite de Mer). Ghost Sybic 26012 was provided for the 12:54 to Paris St Lazare, a route I had not traveled before and of course comfortable with a fine set of Corails. For now this line is still a sure bet for loco-haulage and plenty more sets were seen stabled at Caen. Arrival into Paris was a couple of minutes early. I had a little bit of time to kill before making my way to Paris Est for the 18:12 to Culmont-Chalindrey so hoped to pick up a BB27300 or two. There seemed to be a distinct lack of the locos in the station and the only one I could find was first stop Argenteuil so I flagged that as I thought it was a bit tight on time- a strangely sensible thought for a change. Just as I was contemplating how best to spent my hour in Paris I looked towards the platforms and to my utter surprise BB17068 was pulling in- While these were commonplace only a year ago I thought they had now lost virtually all of their work form St Lazare (and everywhere else for that matter)- certainly I didn't expect to see one on a Sunday. 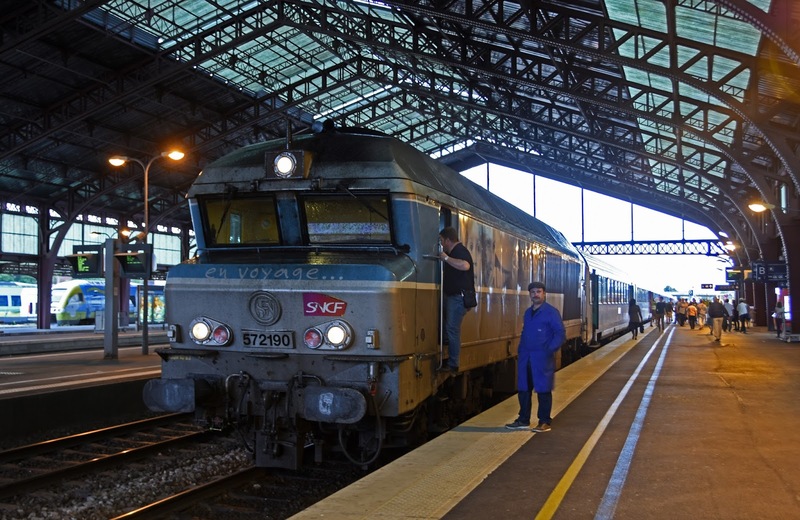 Not only was this possibly my chance to have a ride on one of SNCF's small electrics- it was also required. Obviously it had to be done even though the 16:57's first stop was Argenteuil... so much for being sensible! Of coures it isn't quite the same riding these on VB2N stock as it was on the RIO's but that isn't a choice anymore. On the return BB27367 was taken back to St Lazare before a quick dash over to Paris Est on the RER. This was the first big test of my quickly hashed together itinerary. The only booked working for a CC72100 these days on a Sunday is the 18:12 to Culmont-Chalindrey. If it wasn't hauled there was no point trying to get into Germany through Belfort. 20 mins before the train was due to leave there was no sign of any stock, only the ominous presence of one of the Alsthom Coradia units which have now taken over almost all Line 4 workings. With no platform allocation I sought out the only loco hauled train in the station with BB15001 and BB15050 in platform 1. I came back to the coucourse to find the 18:12 allocated to platform 9. I hadn't seen any stock arrive and I could swear that was where the Coradia was... It wasn't going to happen was it. 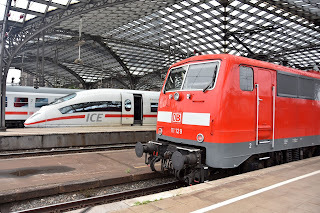 Just I was thinking what on earth plan B might be the broken nose of a BB15000 came into view next to the Coradia... could it be? Yes- it was! From somewhere some stock had arrived and the nasty Coradia was actually on platform 10. That was a relief- but left me just 10 mins to grab photos (in appalling light) some food, and try to use the station WiFi to book a room in Belfort! I managed the first two. Required CC72190 was the power that I would take through to Chaumont, the heart scraped into the dirt on the locomotive appropriately displaying the enthusiasts affection for these locos in their dying days. Photography under the trainshed at Troyes is never easy and the rubbish weather didn't help either! CC72190 pauses with the 18:12 Paris Est - Culmont Chalindrey, the only booked working on a Sunday and likely my farewell to this classic class of locomotive which I first met in Paris back in 2011. 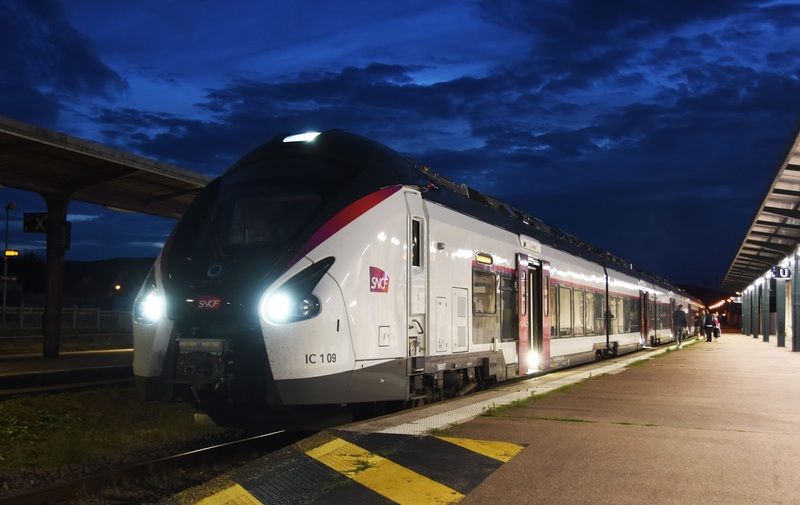 The new order, an Alstom Coradia unit at Vesoul. Away from Paris Est on time it was sad to pass Pantin looking out for the big diesels (and CC72084 of course) stabled there to only see Coradias. At Nangis we passed a set of stock which had clearly been there some time- I can only presume since CC72141 hit a car here back in 2015? 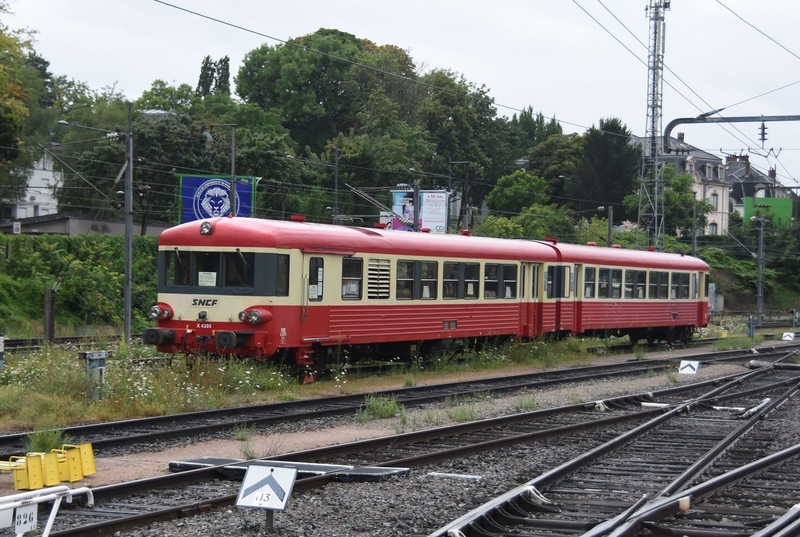 Sad again to see such a low value placed on the Corail stock that it can simply be abandoned. We also slowed down in this area causing a delay of a few minutes which the train would never make up. Chaumont came around all too quickly and it was time to say goodbye to 72190, after possibly my last big diesel ride in France. 10 minutes behind was the 18:42 ex-Paris which would continue my journey to Belfort. My first taste of the Intercities Coradia's, and I have to admit, aside from it being a unit it wasn't bad at all. I can't see myself coming back to this line once the loco's finish but I'm sure the 'normal' passengers will appreciated these new trains which are comfortable and modern- and a vast improvement over an AGC at least. Accommodation for the night ended up being the Hotel Kyriad which owing to mobile internet not working on my phone was booked by my Dad over the phone from the UK! The hotel was reasonable and largely refurbished, however my corridor still resembled a building site, the room itself was ok if spartan. 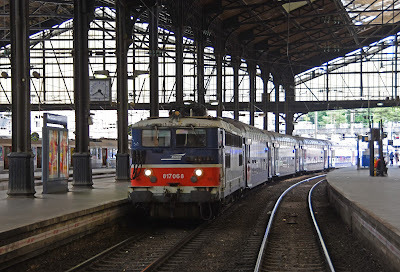 A 'Carvelle' shows off the SNCF heritage scene at Mulhouse. Woke to rain again in Belfort. My decision to pay for the hotel breakfast proved to be a good one and the raincoat was on again for the walk back to the station. 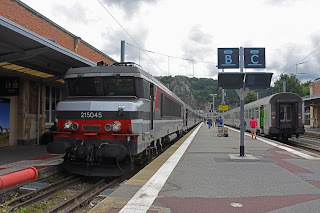 I was sure my train to Mulhouse would be a unit, but as I was walking to the station BB22354 arrived into the station. This turned out to be the train for Lyon while my train to Mulhouse was an AGC. 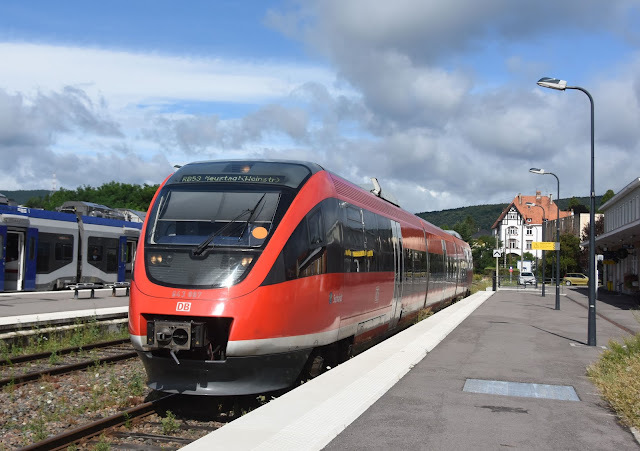 I had a quick connection at Mulhouse during which preserved 'Carvelle' X4395 was photographed- complete with notices asking people not to vandalise it- I'm not sure that is how it is supposed to work!? It was nice to be on a 'proper' train again on to Strasbourg with BB26141 providing the power, the weather improved during the run as well. The weather has brightened up considerably by the time I chance from SNCF to DB at Wissembourg. DB 'Talent' Unit 643 007 will take me across the border and on to Neustadt. 24/07/2017. I was hoping I might see a few of the commuter push pull turns at Strasbourg and looked up some old diagrams. Nothing booked on the BB67400 front though there were a few turns with BB25000 that could have produced depending what work these locos had left. 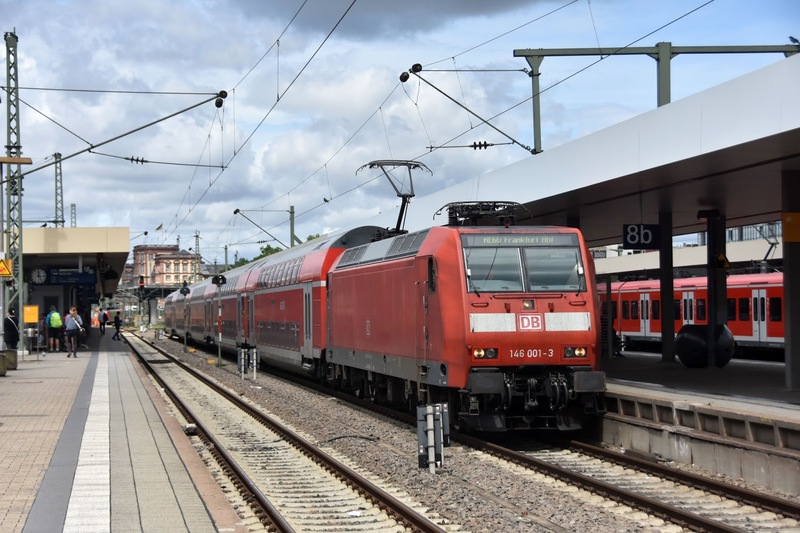 I was to be disappointed as no locos were seen between Selestat and Strasbourg and there was no sign of any push-pull activity at Strasbourg either. A couple of BB25000 were parked up by the workshop and a line of BB67400 were further back. No sign of any RRR sets at all that I could see. BB26150 was seen sporting 'Grand Est' another non-livery in my opinion but a new one on me (swap the couloured bits of 'Vermillion' for blue). is the power from Mannheim to Frakfurt Main 24/07/2017. I deviated from my planned route into Germany and rather than heading for an ICE from Offenburg elected to take local trains via Wissembourg. A Regiolis completing the French side and a Talent unit into Germany. I tried to buy a German FIP ticket from the SNCF window but was told to use the machine- opting for the Bahn card 50 option didn't go down wonderfully with one conductor who just said 'bahn card' to me several times before accepting the FIP, the other conductor was happy no questions asked. 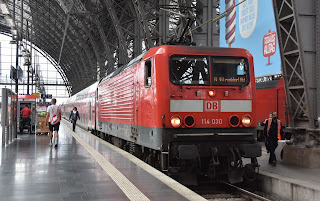 The route up to Frankfurt continued via Neustadt and then a suburban train on to Mannheim. 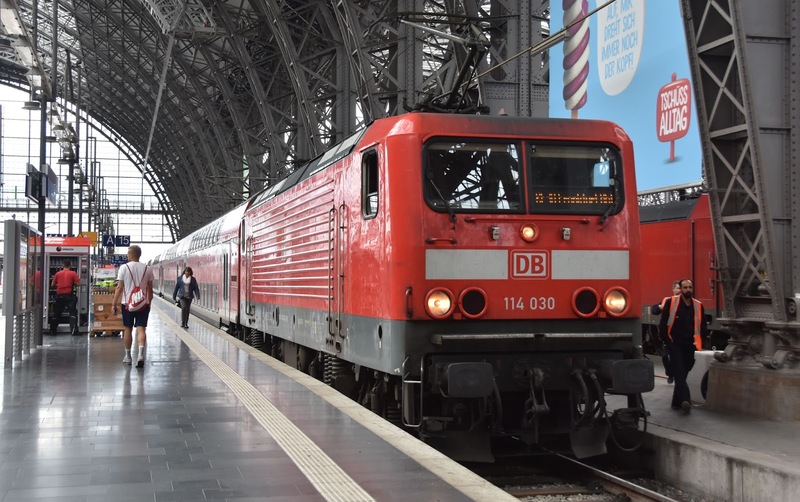 There were a couple of options on to Frankfurt from here but as the first one was a rake of Dostsos with 146001 I chose that option via Darmstadt. 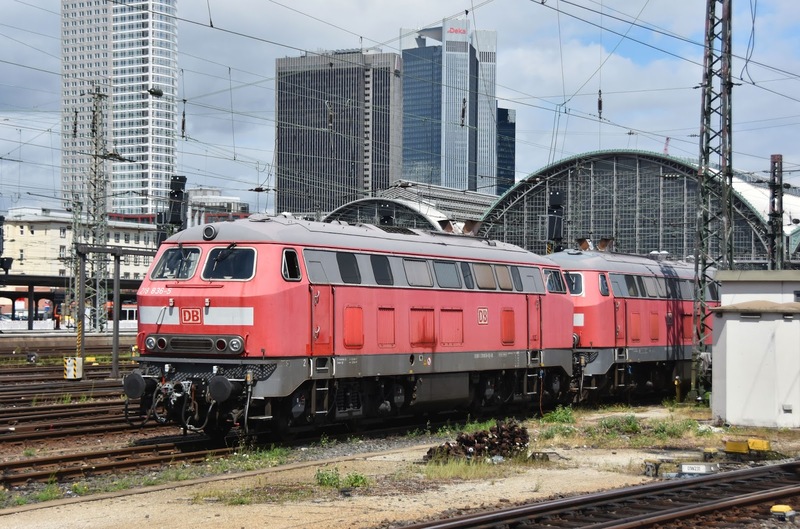 'Thunderbunnies' at Frankfurt- 218836 and 218813 await their next rescue call. Frankfurt is always a hive of activity, though there has been a reduction of RE locos since I was last here. The plan was to have a quick spin on a 111 and/or 143. This didn't go well. Two sets of N-Wagons appeared with 111's that would have been suitable, but by the time I got to the front of the queue to get my FIP ticket from the DB ticket office they had already gone (allow a good 15 mins for a visit to a DB ticket office). I cut my losses, got a Bratwerst and continued on my next leg towards Koblenz. Plenty of RE loco hauled action still appears at Frankfurt. I was aware that locos had disappeared from local trains on the Rhein Valley and my train was some variation of Stadtler Flirt. I must say despite the lack of a loco the train was very comfortable and pleasant. There was even a guy pushing a food trolley around, presumably legitimately as he was wearing no trace of uniform of DB identification that I could see. The DB staff travelling on the train got a free coffee though so it must have been fine. I didn't see him serve anybody else! I was hoping to get off at Oberwesel to spend a few hours photographing in the Rhein Valley but a few mintues before our arrival we entered a tremendous thunderstorm to the extent that the other side of the river could hardly be seen. 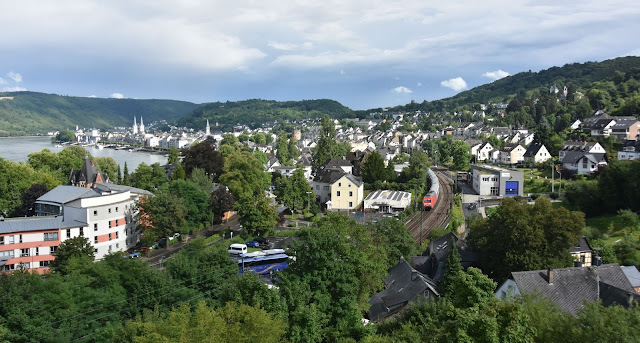 I stayed on to Boppard where the weather had cleared a little- this is a lovely area and I am sure to be back. Another Flirt on to Koblenz and while there were hauled RE options from here the lure of an OBB compartment proved too much as 101056 pulled in with a EuroCity. The sun was out now so I spent an hour or so on the station before heading off to my hotel in town, the Casa Visa (excellent if you like an orange bathroom) and then found a spot by the river for dinner. I had a night photo session planned at the station but the trains didn't play ball and I was told not to use my tripod during my first shot- clearly the biggest issue on a Monday night when there are drunks and screaming kids running around the station. A stunning view over Boppard with a northbound IC heading along the banks of the Rhine before it rained again. I shall be back! Surprise Surprise- raining again. A good (free) breakfast at the hotel where I got the impression there were only about 3 guests. 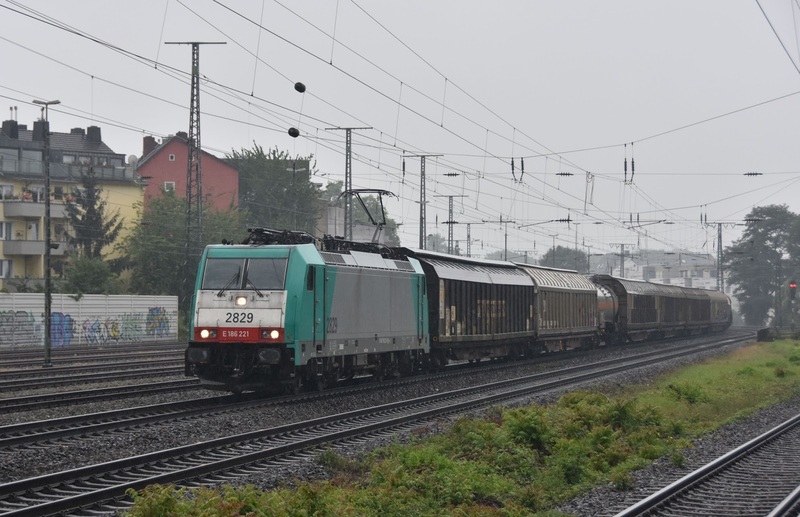 Waked over to Koln West for some freight action- around 10 trains were seen in around 80 minutes with a fair selection of traction. 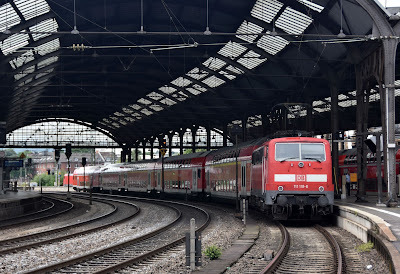 It was then time to try spinning some locos out of Cologne taking a 146266 down to Bruhl and 146268 back to Koln Hbf. This batch of Traxx locos are quite musical- though not quite as good as a singing Taurus! 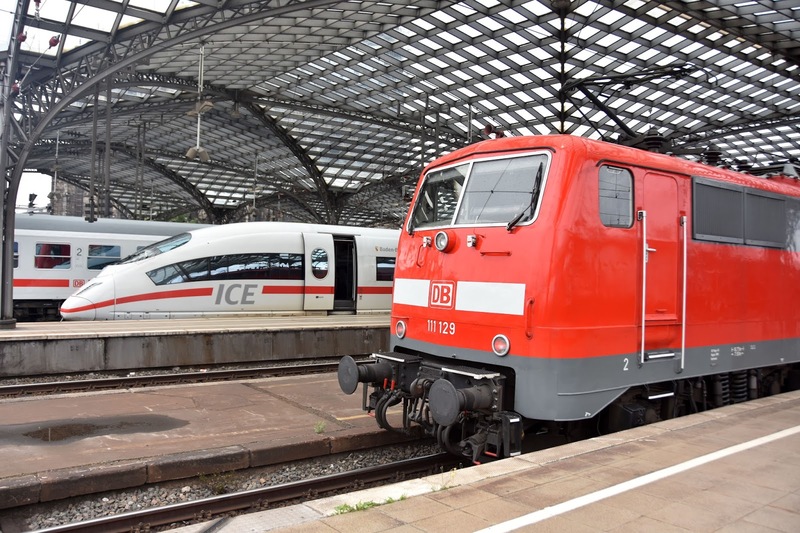 IC, ICE and RE trains at Koln Hbf 25/07/2017. It was time for the final days travelling to begin now and finally a ride with a 111, traction to Aachen being 111129. A few more locos were seen at Aachen before I boarded my SNCB unit across the border to Welkenraedt. Back on a proper train from here with 1861 and 1805 taking me on to Brusseles Nord. I eventually had to change carriages as another small child was making a repeated unpleasant noise in the front one which I could only stand for so long! 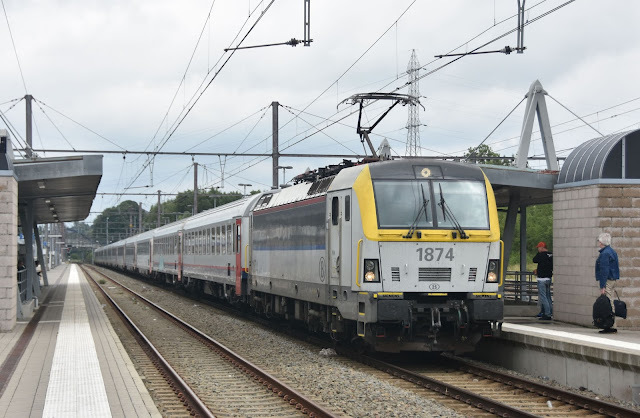 I was running ahead of schedule so had time here to pick up another loco into Brusselles Zuid/Midi- but with so many platforms finding what you want and making it on board proved difficult. What I wanted was a class 27 or 21 on the 'fresh air' coaches. I eventually settled for 2863 on an InterCity Direct. DB gives way to SNCB on my journey at Aachen where 111 118 waits to work back to Hamm. The big question of the day was whether I would manage to secure my FIP Eurostar ticket back home- it was a bit of a risk but paid off with space being available on the 19:52 train as I had hoped. This left me a couple of hours to try again at spinning some of the older electrics. Again this is difficult on normal tickets if you have not done your research and don't know what goes where (as was my case). Even less helpful is that my InterRail app seemed to be showing the stations in French, whereas the station was advertising them in Flemish, the destinations often being totally different. Once I eventually found the booking office at Midi I got a ticket to Mechelen. 1874 arrives at Welkenraedt with the train to Oostend which would convey me as far as Brussels. 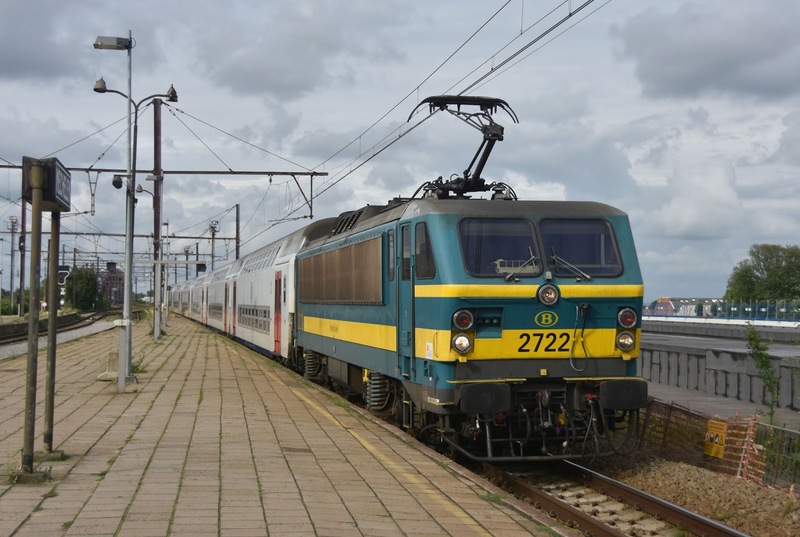 Despite their power many Belgian trains have multiple 'Vectron' locos in their consist- this one had another on the rear. 25/07/2017. Belgian 'Goggles'? EMU 912 at Mechelen. Now I just needed to find an appropriate train going there. 2153 was my chosen train from Midi to Nord but I couldn't work out whether or not that went on to Mechelen or not. Infact I could not work out where it was going at all with my multi-lingual issue! I took the safe option and bailed off at Nord. 1893 and 1856 took me on to Mechelen where I would hope for some more turquoise action on the return. Mechelen station has some charm but does also illustrate how neglected and run down most Belgain stations appear to be. Certainly compared to the spotless, modern and well maintained stations of France and Germany. 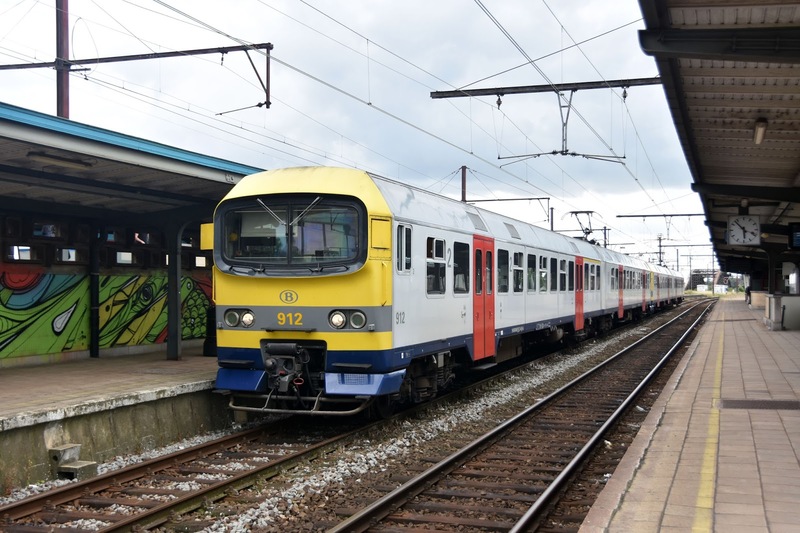 I have always considered Brusseles Midi to be a bit of a dump, but actually compared to many other SNCB stations it is probably actually one of the better. At Mechelen there seemed to be plenty of loco hauled trains heading away from Brussels but everything heading in the direction I was after was producing units. Eventually after over 45 minutes I was finally rewarded with 2722 back to Midi. 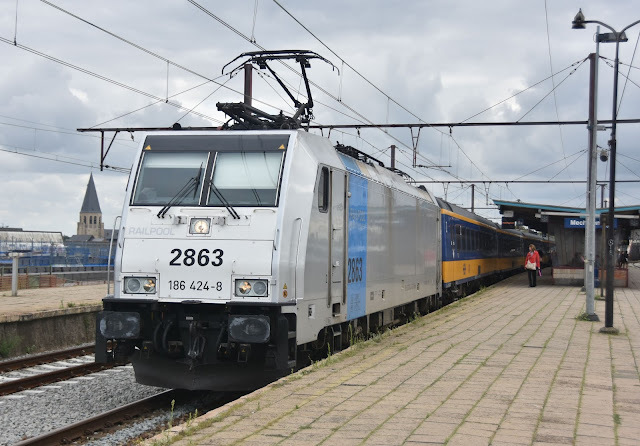 Following the disaster that was the attempted introduction of High Speed 'Fyra' units on the Brusseles - Amsterdam service conventional NS loco hauled stock is now once again used and powered by hired in class 186 Traxx locos. 2863 pauses at Mechelen with a service to Breda (engineering works in the Netherlands curtailing the train). 2722 rolls into Mechelen with a service to Brussels. 25/07/2017. Now all that remained was to board my Eurostar (3001/2) and finally head home after a crazy few days and completing over 1,300 miles. I upset the security people on the Eurostar platforms by standing at the front of the train to take some photos (I may not see another 'original' Eurostar here? )- I don't think the photos were a problem but apparently standing at the front sets off an 'alarm'. What should have been more of a concern was that the reservations on the set were all reversed with coach 18 where coach 1 should have been. This didn't help boarding and we left a few minutes late with plenty of people in the wrong seats. This wasn't a huge issue until Lille Europe where the correct incumbents of those seats then turned up. Leaving 15 minutes late from Lille made this the latest train I had been on all trip and missed us our slot through the tunnel securing an almost 20 minute late arrival in London. 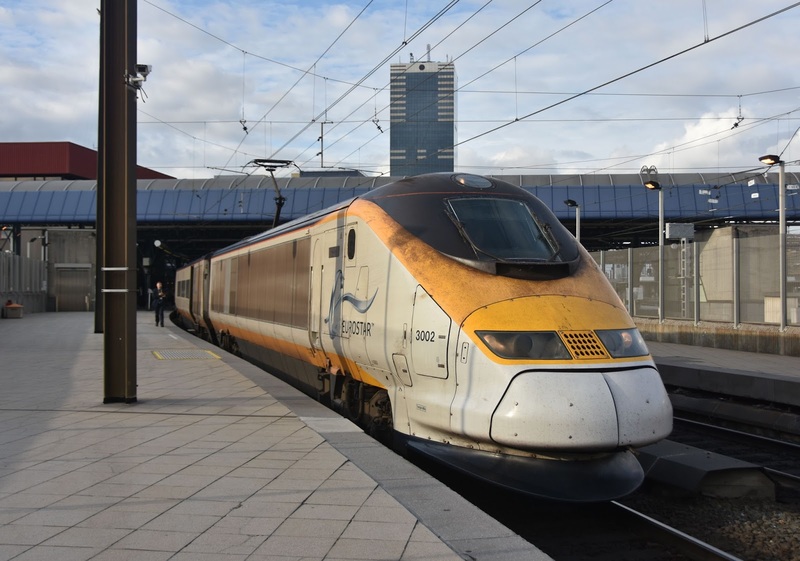 I find it amazing that the last Eurostar from Brussels to London is as early as 19:52 (21:03 arrival) though it does have the useful advantage of making sure I get home at a reasonable hour! Glad you enjoyed Frankfurt und Köln -(a beautiful city that's often underrated). Besides France, België is another favourite of mine for bashing trips closer to home. 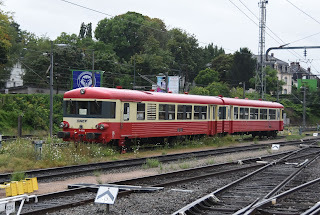 Most of the older locos are gone now as you know but I still find the old AM64 units and Eurofima cars fun to ride in. You mentioned trouble with the Dutch and French placenames on the rail planner app -(a wonderful resource), language is a highly divisive issue in Belgium! I don't know if you are aware of www.beluxtrains.net ? I use this whenever I go to Belgium. Its very very useful, providing diagrams for everything in Belgium and Luxembourg, so you can get your haulages in. Nice to end the trip with a classic TMST. 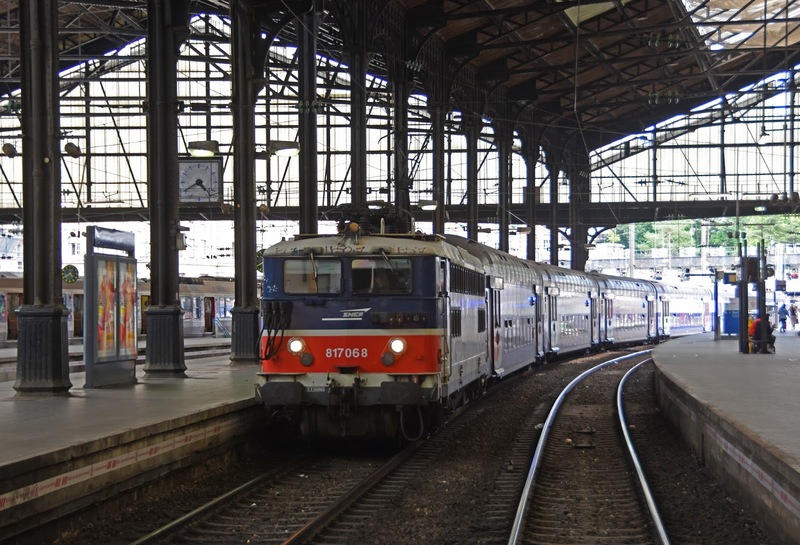 I have many happy memories traveling to/from the continent on these trains over the years. Its a real pity they are being scrapped at such a young age but that is another highly controversial subject!